I finished a good book I won in a giveaway from Books I Think You Should Read earlier this week. 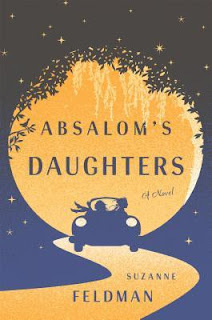 Absalom's Daughters by Suzanne Feldman was an interesting book which also satisfied the 23rd category on my reading challenge this year - a book that is published in 2016. Absalom's Daughters is about Cassie and Judith, both daughters of the same man, but not raised as sisters. He impregnated Cassie's mother for reasons not entirely known by either of them, and was briefly settled down with Judith's mother and other siblings. By the time this book takes place, however, it's all about catching up with him again. The sisters' joint road trip ends up less about their father, and more about getting to know themselves and each other. For the reader, it's also learning about the U.S. and racial disparity in the 1950s. By the end, their social status based on their appearances wasn't entirely about race. People are different all over, and this great story showed the good and the bad in many of the characters. It was a really enjoyable read that truly made you feel like you were there with them. I'd recommend this book. As I've said before, reading for me really is about escapism and seeing the world through the characters' eyes. This book gave plenty of that, as I tried to imagine just where I'd fit in the 1950s. Glad you liked it - I haven't read it yet but from the synopsis, it sounded very interesting. Sounds great! Amazing book indeed. Love the plot or synopsis of it too! This sounds like a book I'd like to read. Thank you for the great summary. This sounds like a good one for our next book club. We just finished Daughters of the Dragon which I highly recommend!